This bread was new to me but didn’t disappoint. Semolina bread is an Italian baking classic. It’s chewy and dense. The semolina flour used to make the loaf is milled from durum wheat. That’s the same flour used to make pasta. 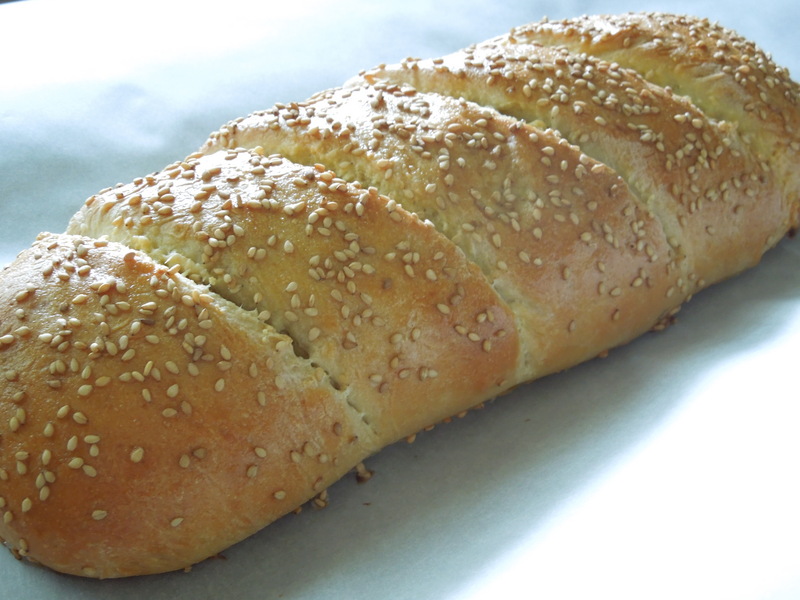 This loaf is very easy to make but an all day project–the total rising time is about 6 hours. You can find the recipe here at: The Way to My Family’s Heart and Keep it Luce. The hardest part for me was finding semolina flour. My regular grocery store didn’t carry it. I found a bag of Bob’s Red Mill Semolina Flour at a slightly more upscale grocery nearby. Other than that it was a series of fairly easy steps: mix the yeast with some water and flour for the sponge (then rest for 2 hours), make the dough in a food processor (rise for 2 hours), shape the dough (rise for 2 more hours), and then bake for 35 minutes at 400 degrees F.
Other bloggers have complained about the saltiness of this bread so I did reduce the salt slightly than what the recipe called for to 1 1/2 teaspoons. I was not shy with the slashing and used a long serrated knife to make the cuts. After researching semolina bread a little online I decided to use an egg wash and add some sesame seeds to the top. This seems to be the classic presentation. Semolina bread is a hearty comforting loaf that can compliment just about any meal. That makes it a keeper in my book. This is the easiest most delicious biscotti recipe I have ever prepared. Dangerously so. I can see this becoming a weekly indulgence. You can find the recipe at this week’s hosts: Homemade and Wholesome and Baking and Boys. I purchased some chopped hazelnuts at the store and toasted them in a 350 degree oven for 4-5 minutes. Then I stirred the dry ingredients in a bowl: flour, baking soda, and salt. The wet ingredients were stirred in another bowl: eggs, liqueur (I used rum because I didn’t have any Frangelico), vanilla, and sugar. The dry ingredients are added to the wet and mixed with a wooden spoon. Last the toasted nuts are added just until combined. This very sticky dough is formed into two logs about 12 inches long each. I baked the logs for exactly 35 minutes at 300 degrees F.
After cooling for a bit, I cut the logs into 1/2 inch slices. I baked them a second time on a cooling rack for about 11 minutes at 300 degrees F. This is a neat trick that keeps air circulating around the whole cookie without having to flip them over. For a finishing touch I melted 3 ounces of semi-sweet chocolate chips with 1/2 teaspoon of shortening in the microwave. 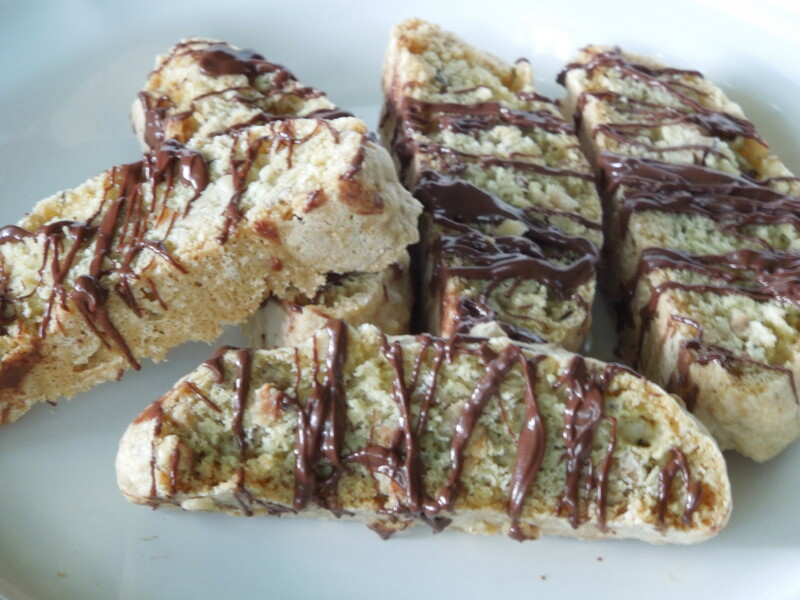 I used a fork to drizzle the melted chocolate over the biscotti. The verdict is that these biscotti are FABULOUS. Gobbled right up. I am already thinking about making another batch tomorrow. The add-ins seem endless. You can use any nut you like. Dried fruit seems to be a must try. Different liqueurs. More chocolate. These are so good and so easy! Perfectly crunchy and calling out to be dipped in a cup of tea.